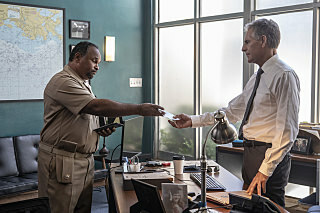 NCIS: New Orleans 5.06 - "Pound of Flesh"
multiple victims. Also, Pride turns to his friend, Commander Calvin Atkins, M.D. ramifications of his recent brush with death. first sebastian and hannah let escape marquez - and the attack on sebastian was more than predictable - then, not even a minute later, hannah, gregorio and lasalle let him escape again. why are they walking around with their guns drawn if they don't use them? pride going into the house where jenny was held alone although backup was two minutes away and near the end of the ep checking on jenny before checking the rooms? he is an experienced agent - at least i thought so. Agreed with what you have said nuwanda. I don't really remember much about the episode honestly. Shows how much I was paying attention Getting really boring with the same ol Pride stuff. I am on the verge of not watching any more. 2. Getting really boring with the same ol Pride stuff. I am on the verge of not watching any more. 1. had that problem too. I agree with what has been said about the stupid moves being made. What are the writers thinking? And completely agree with what has been said!